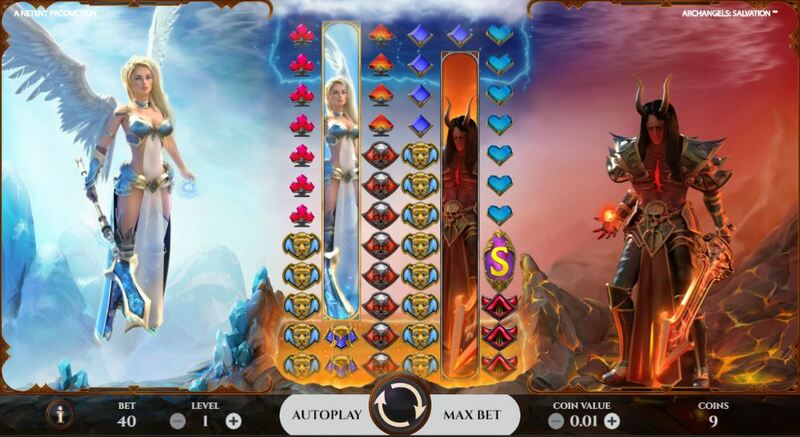 Join the battle between good and evil and choose which side you will stand for in this epic casino game from NetEnt, Archangels: Salvation slot. This video slot features 6 reels, a whopping 12 rows and 100 pay lines. Let the battle commence. This NetEnt creation is stunning and gripping from the outset, with the screen split down the middle and into two sides. One is a beautiful female archangel, who appears floating with giant white wings, as a messenger from heaven. This side is white and blue with an ethereal tone and in complete contrast the fallen angel on the other side, Satan. This evil looking character is situated in the flaming pits of hell and wields a red flaming sword, as opposed to the blue and gold one the female angel carries. The imagery is so striking and is perfectly complemented by the action soundtrack that accompanies it. The characters are both animated and when they come together to complete wins, it really is a sight to behold. If you love this angle vs. devil theme, head to Easy Slots right now where you can play right away for real cash prizes. Or search Easy to play online slots! NetEnt really need no introduction as they are one of the most well-known slot game providers in the world, and one of the very best. This is largely due to the skill of their team, who put incredible, movie-quality attention to detail into the themes of their games to create a player experience that is thrilling, fun and immersive. 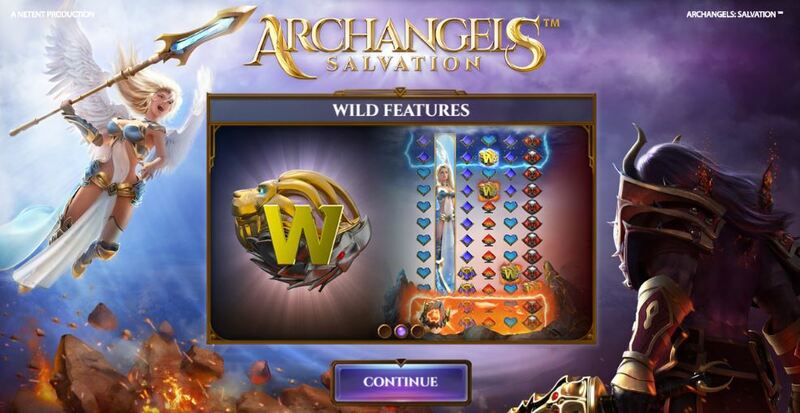 This Archangels: Salvation online slot game is one example of this superior skill set. If you loved this mobile slot, why not check out some other slot games online like Cosmic Eclipse or Asgardian Stones. As usual with a NetEnt title, this slot is jam packed with bonus features that will help you on your quest to win big prizes and defeat evil in the process. The first symbol to look out for is the game’s wild which can appear as a block of 2x2 symbols. Stacks and single wilds only appear during the heaven and hell features. It will substitute all symbols except the scatter. The game has, what are referred to as hot spot areas which are at the top and bottom of the reels and this is where the heaven and hell features can be activated if a 2x2 wild lands in that area. During the heaven feature if a 2x2 wild lands in the hot spot area, even partially, 2 stacks will be generated of the wild symbol. If it lands fully in the hot spot, 4 will be generated. During the hell feature, single wilds generated is either 8 or 16 depending on where it lands fully or partially in the hot spot. Other cool features and bonuses in this game include free spins, a feature reactivation and symbols to look out for are the devils and angel as these are lucrative symbols.